The finals weekend is almost upon us; titanic clashes, last-minute upsets, and who knows what else is in store. While the hours tick down to the final matches, here are some quick stats from Weekend 2 of Alliance Tournament XIV. Now that teams had seen the kind of things their opponents were fielding, the tighter many fleet compositions became. 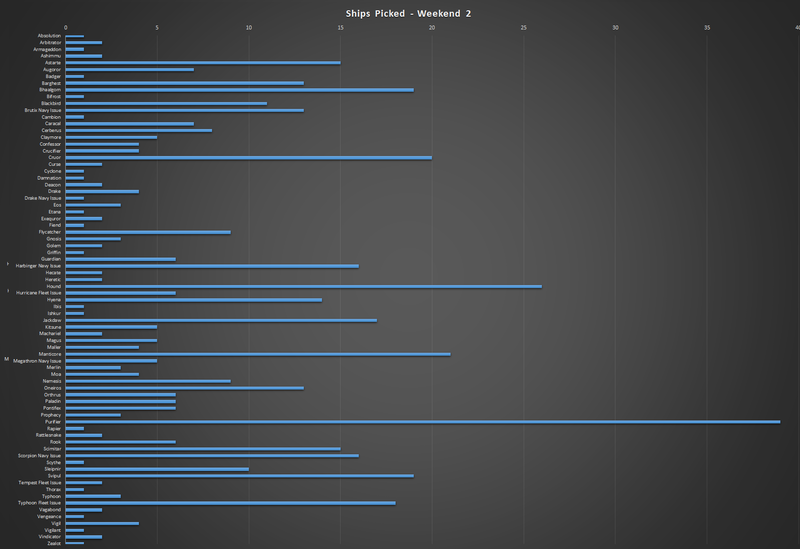 136 different ships took to the field in weekend 1, but weekend 2 saw more streamlined options and just 76 different ship picks. Bombers overtook the previously dominant Svipul pick; 95 bombers made it into battle compared to just 42 T3D's. The Etana and Fiend both returned for the second weekend, joined on the AT Prize Ship Outing by NC. 's Cambion. With streamlined picks come streamlined bans- the repping power of the Oneiros and Guardian continued to be a considerable threat, but the prevalence of ECM ships like the Kitsune and Blackbird earned them a sizeable amount of bans too. 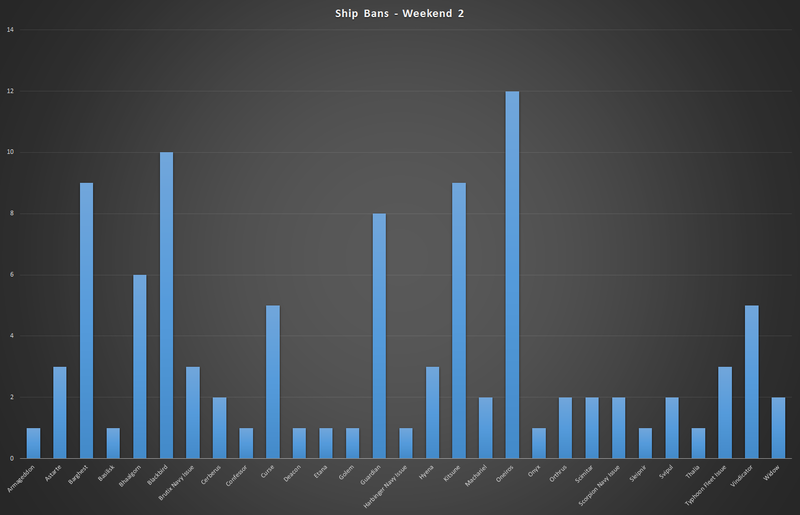 The Barghest overtook the Bhaalgorn as the battleship with the highest number of bans, while Navy and Fleet Issue ships picked up almost 10% of the bans for the weekend. Those poor Purifiers. 301 ships met their doom last weekend, and 24 of those were the Amarrian Stealth Bomber. 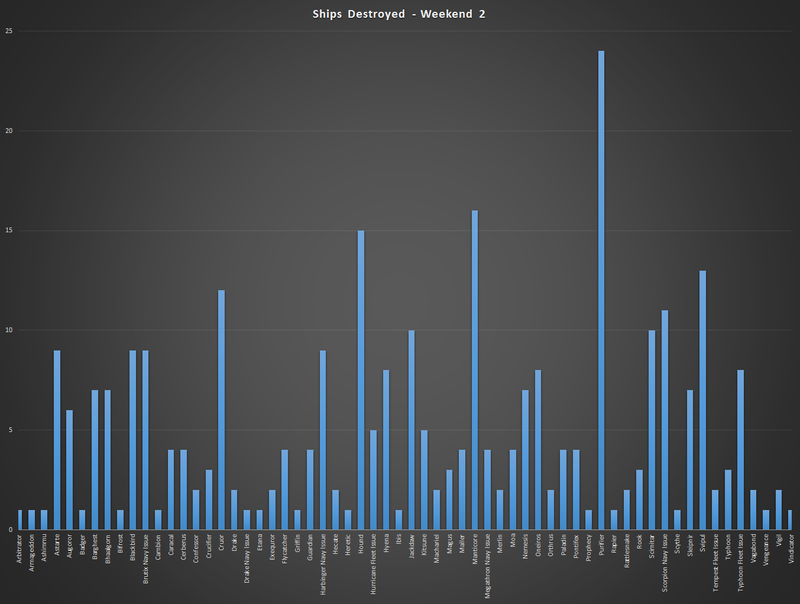 A bad weekend to be working on a Caldari ship, as they provided the most explosions (though very closely followed by Minmatar hulls). Despite the reduced cost of Blood Raider ships, pirate faction ships escaped certain doom better than any other faction as only 39 met an untimely end. 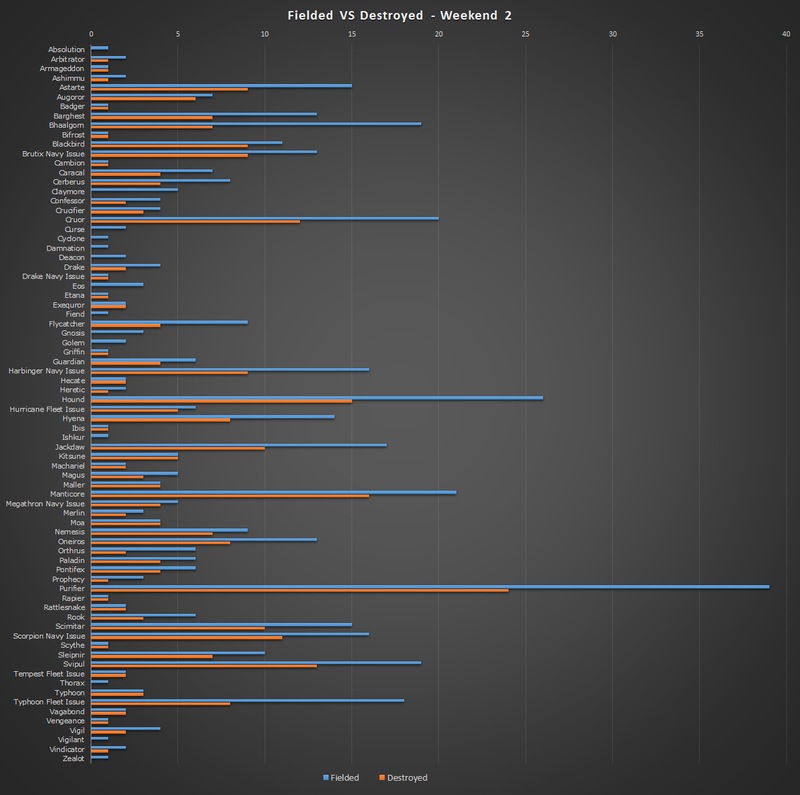 A fuller look at the most targeted ships this time around. 14 ship types suffered no losses at all, including the Fiend of NC and the single Ishkur fielded by The R0NIN against Phoebe Freeport Republic. While the Sleipnir saw a 70% loss rate, its counterpart the Claymore escaped unscathed from the 5 matches they took part in. Not a single Kitsune, Maller, or Moa was left alive. but less than half of the Bhaalgorns that were brought out to fight ended up as salvage piles. Another 7 confirmed flagship kills in the second weekend (I believe Complaints Department also lost their flagship, but currently unable to find the killmail). Exodus' Bhaalgorn dropped 3 of its 5 Officer modules, while Hard Knocks Citizens' Bhaalgorn sported no fewer than 12 Officer or Faction modules.